The Fraser Nash series of cars started in 1925 with the “Anzani”, built by Archibald Frazer-Nash and later by the Aldington brothers in Isleworth, London, England, they ceased building cars in 1956. Siteseen Ltd. are the sole copyright holders of this Fraser Nash Mille Miglia picture, unless otherwise stated. We only authorise non-commercial picture use and particularly encourage their use for educational purposes. 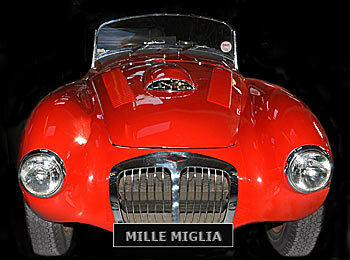 This Fraser Nash Mille Miglia Fast Car picture is not in the Public Domain. 1) www.educationalresource.info must be credited as the copyright holders wherever this Fraser Nash Mille Miglia fast car picture is used. 3) Use of this Fraser Nash Mille Miglia fast car picture, or any of our pictures on websites re-distributing copyright free material is strictly prohibited.